A small cry is heard. 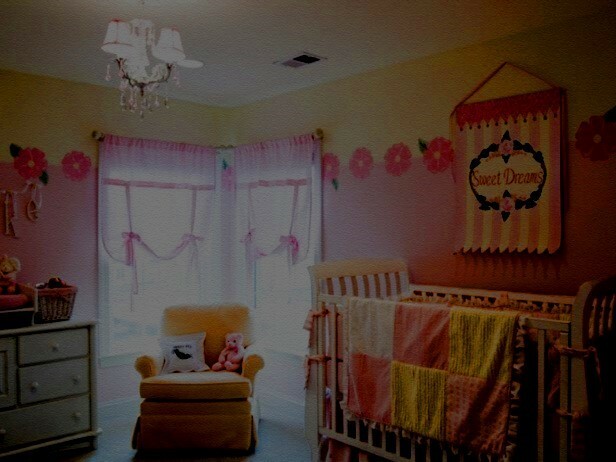 A night light comes on and we see a pink and yellow nursery. Lexie walks in…she peers into the crib. Lexie: Hey baby girl…time for your next bottle huh, sweet heart? Lexie picks her up and sits in her rocking chair near the window. Feeding her, her middle of the night bottle as she carefully rocks back and forth. A mixture of sleep depravity and happiness spread across the new mom’s face. Carter: (leaning against the door frame) Hey…you want me to take over? You should get some rest. Lexie: Happy. (she smiles) This is…perfect. Carter smiles, and walks into the room. As he does the sign hanging on the baby’s door is put into clear focus. 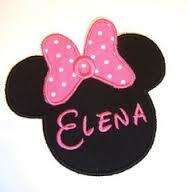 The name reads Elena. Carter bends down and kisses the babies forehead, and then kisses Lexie. She smiles. 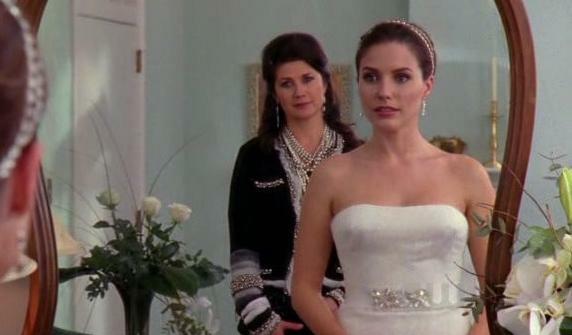 Lexie stands in a small chapel room, dressed in a wedding dress. She looks in the mirror and smiles. Roxy, and Joan (Carter’s mother) are seen smiling behind her. Lexie: So…what do you think? Roxy: You look amazing! Seriously it doesn’t even look like you had a baby 3 weeks ago. Joan is holding Elena and smiles. Joan: Honey you look perfect. Carter is going to be speechless. Lexie: And what about you angel? How do you think mommy looks…you think daddy will like it? Roxy: I think daddy’s going to like it so much, he may just get mommy knocked up again. Joan goes a shade of crimson red. 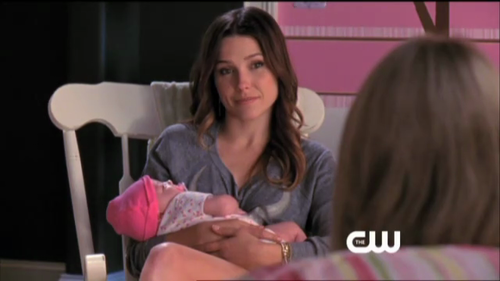 Lexie: Oh my god, Roxy! Really? Roxy: Oh I’m sorry. I didn’t give you my warning. I’m Roxy, I’ll make you incredibly uncomfortable, with my blunt sense of humor. Just ask your son, it didn’t take me more then 5 minutes to mortify him. Joan: Well as long as Carter is happy, I’m happy. And you Lexie and this little peanut here, seem to make him happier than he’s ever been. (she smiles) It’s really all a mother can ask for. Lexie: Thank You Joan. 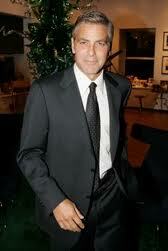 You and John have raised such an incredible man. 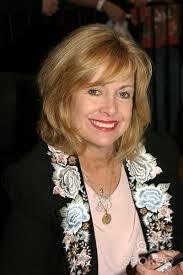 Joan: Thank you sweet heart, you look beautiful and today is going to be a perfect day. Should I let the men know we’re ready? She puts the baby in her carriage and wheels her out. Roxy: So… you ready for this? Lexie: Yea…it’s been a long time coming. You know I thought I’d be nervous but, I’m not. I can’t wait to be his wife. I just wish my mom were here to be with me through this ya know….I kinda wish my dad were here too…to walk me down the aisle. Roxy: Well you were born into this world alone, you can handle a walk down a measley aisle alone… Or you know I could walk you? It’d save me a trip down the aisle alone too. Maid of honor duties are lonely…seriously what is up with that? Lexie: (she laughs) I’d love that, if you’d walk with me. Roxy: I got you something. She hands her a long skinny box. Roxy: Uh…shh. My best friend is getting married. I wanted to. Lexie opens the box to find a silver locket engraved with the name Elena. Lexie: Oh Rox- it’s beautiful. Lexie carefully opens the locket to find on one side a picture of her daughter and the other side a picture of her mother. Roxy: I knew you’d want her here with you today…this way she can be. Lexie: Thank You so much, this means so much to me. You have no idea. Lexie nods hugging her tightly. Lexie: Will you help me put it on? Roxy fastens the necklace onto Lexie’s neck. Roxy: Ok no more tears. Stop. 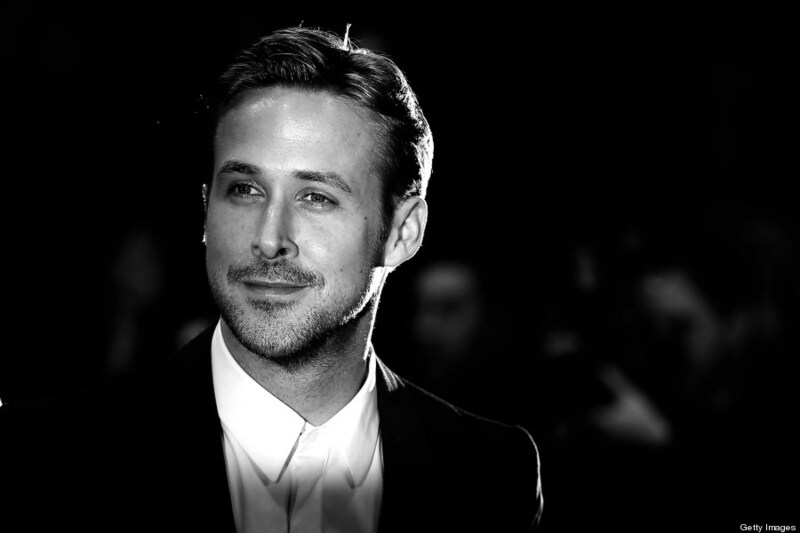 We have a man to marry. Right? Lexie shakes it off and smiles. Roxy: Ok. (she wipes away her own tears and then some of Lexie’s) Let’s do thi s.
Lexie: Promise me you’ll stick around, at least for a little while. I really love having you here. Roxy: Honey, I plan on sticking around till you get sick of me. Joan walks Elena down the aisle in a white lace old fashioned carriage. Lexie smiles and links her arm with her best friend, as they walk out into the church. Carter sees Lexie for the first time and smiles brightly. 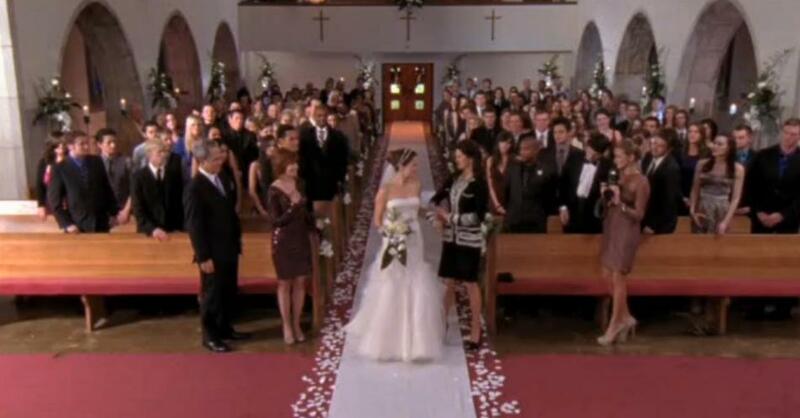 Roxy walks Lexie down the aisle. Roxy smiles at Brice who sits in the audience near Joe, Kelly, Dylan, and Joan and baby Elena. 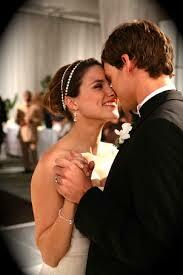 Carter meets Lexie at the altar steps, kisses Roxy on the cheek, takes Lexie’s hand and helps her up to the alter. They join hands. 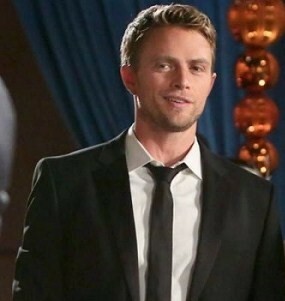 As Roxy takes her place beside Lexie, we see Carter’s dad John standing next to Carter as his best man. The organ playing stops and the priest smiles at the couple. The priest: Please be seated everyone. We are gathered here today to join Lexie and Carter in holy matrimony. I’ve been told that this is a rather unconventional love story. But I know true love when I see it. Lexie: I’ve always envisioned love as this unattainable thing. I was so caught up in the negative aspects of life that I never took the time to realize that I was actually capable of falling in love with someone who would love me for the real me, and not be duped by the façade I put on for the world to see. Someone who would be there unconditionally… Someone to walk through life with. When I met you I did everything I could to try and convince myself that you weren’t the one. That what I was feeling was just fleeting. I pushed you away and kept pushing. 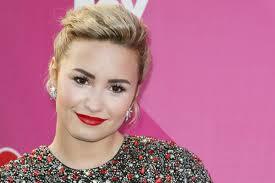 But you stayed, I don’t know why (she laughs) But you did. And you made me realize that being afraid was ok, that as long as you let someone in on the fears you have that they may share those fears but help you overcome them at the same time, together as a unit. You made me happy to look forward to a future full of love and children and happiness. You changed my out look on love and you made me able to feel it and experience it in the best possible, most truest of ways. 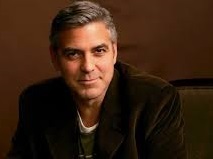 And I will forever love you for that and for being the incredible man that you are. Carter: Falling for you wasn’t easy. Loving you was the easiest thing in the world. But falling for you wasn’t…allowing myself to get to the point of falling in love with you was really difficult. When we met, I was really broken; I didn’t know what my life was or where it was heading. You lit a fire in me that I thought had died a long time ago. Something that I thought I’d never get back. And I’ve never been more excited for the future in my entire life. I’ve never been more excited to experience new adventures that I am sure we will have as a newly married couple and new parents to our beautiful baby girl. You’ve made me happier than I have ever been, and you’ve made me a better man simply by loving me. A few years ago, it may not have seemed like we would ever get here, but in my heart I always knew that it was a possibility. If I could just get you to see in us what I saw in you. I knew it, because I knew your heart, it’s a lot like mine, a little broken, but somehow half of my broken heart fit perfectly with half of yours and I think it’s safe to say, we’re stronger together, then we ever were apart. You’re an amazing woman…Strong, Stubborn, Smart, Beautiful, and I’m going to spend the rest of my life making sure that you know that. Because you’re worth it. That’s why I stayed. Lexie and Carter smile brightly at eachother. Priest: Do you Lexie take Carter to be your husband, in sickness and in health, for richer or poorer, for better for worse, til death do you part? Priest: And Carter do you take Lexie to be your wife, in sickness and in health, for richer or poorer, for better for worse, til death do you part? Priest: Let us proceed with the rings. John hands the priest the rings. Priest: Carter repeat after me…with this ring, I thee wed.
Carter: With this ring, I thee wed. He slides the ring onto Lexie’s finger. Priest: Lexie repeat after me…with this ring, I thee wed.
Lexie: With this ring I thee wed. Priest: By the power vested in me, I now pronounce you husband and wife. You may now kiss the bride. Carter smiles and cups Lexie’s face. The photographer snaps a picture and Lexie gestures for Joan to bring up Elena. Carter and Lexie pose for a picture with their beautiful daughter.